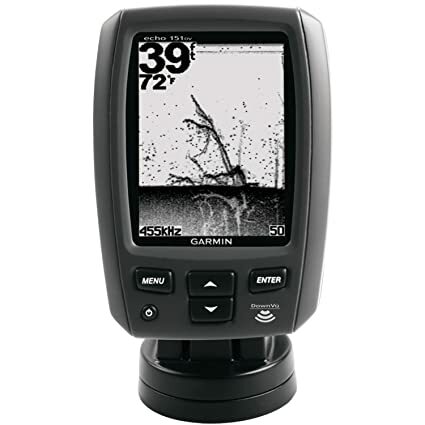 The Powerfully simple 3.5-inch color echo 301dv includes an all-in-one transducer that delivers both advanced HD-ID 77/200 kHz and Garmin DownVu scanned images simultaneously on a horizontally or vertically split screen. The images provide the clearest possible sonar picture of fish returns and nearly photographic structure detail under the boat. Smooth Scaling graphics provide uninterrupted imagery when switching between depth-range scales. The 2,400 W peak-to-peak Power scans as deep as 1,750 feet maximum – and narrow-to-wide viewing cone angles give you a big picture well beyond the sides of your boat. Includes a quick-release tilt/swivel mount plus transom and low-profile trolling motor transducer mounts to make installation a snap. The Powerful, simple-to-use echo 101 has the compact, space-saving design and advanced sonar features youd expect to find only on much higher-priced units. 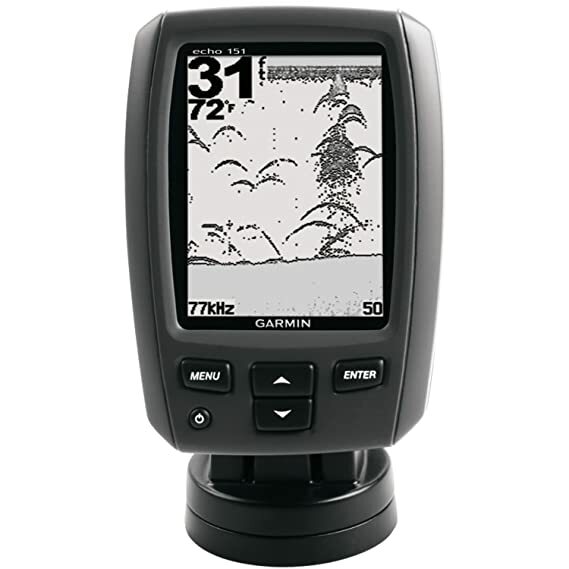 The built-in Garmin advanced HD-ID sonar gives you excellent target separation and fish arch definition on the crisp 4-inch, 256×160 pixel grayscale display. Single-beam (200 kHz) transducer with 1,600 W peak-to-peak Power output dives down to a maximum depth of 1,500 feet . Its compact, space-saving design makes echo 101 the perfect companion for small craft. Includes a quick-release tilt/swivel mount, transducer and versatile transom and trolling motor mount kit to make installation a snap. 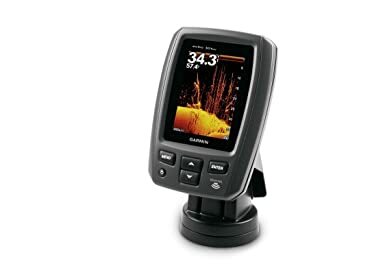 The echo 551dv is a premier fish finder with an all-in-one transducer that delivers both advanced HD-ID 77/200 kHz and Garmin DownVu scanned images simultaneously on a horizontally or vertically split screen. The images provide the clearest possible fish arch returns and nearly photographic bottom/structure details under the boat. With its bright, crisp 5-inch high-resolution VGA color display, the echo 551dv has Smooth Scaling which provides smooth transitions from shallow to deep water and back again. Narrow-to-wide viewing cone angles give you a big picture well beyond the sides of your boat – from shallow water down to 2,300 feet maximum . Also includes sonar history rewind and 4,000 W peak-to-peak Power. Quick-release tilt/swivel mount plus transom and low-profile trolling motor transducer mounts make installation a snap. echo MAP 53dv includes a 5-inch high-contrast color display with automatic backlight adjustment. Fast, responsive 5 Hz GPS/GLONASS refreshes your position and heading 5 times each second to make your movement on the screen more fluid. 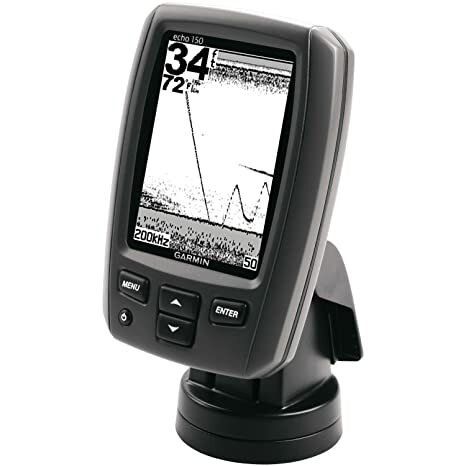 echo MAP comes with 1 transducer for 77/200 kHz HD-ID sonar and Garmin DownV, the clearest scanning sonar on the water. It also supports Minn Kota and Motor Guide trolling motors with integrated transducers. The combo’s cords plug directly into the mount, allowing you to quickly install and remove your device from power and the mount. Transom and trolling motor mount included. 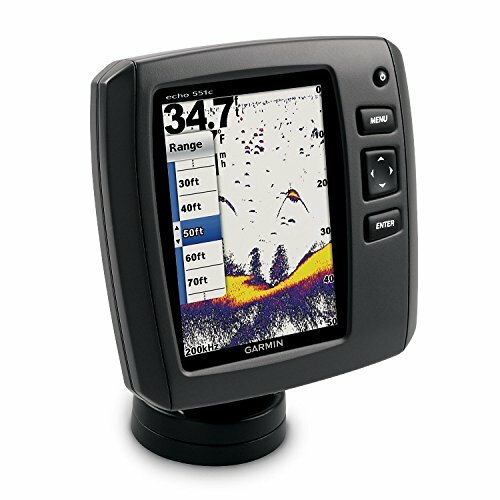 The all-new echoMAP CHIRP dv and sv series chartplotter/sonar combos are available in 4-, 5-, 7- and 9-inch displays. The dv series offers built-in CHIRP traditional sonar and CHIRP DownV. The sv series gives you built-in CHIRP traditional sonar, CHIRP DownV and CHIRP SideV scanning sonar capabilities. The internal 5 Hz GPS updates the position and heading 5 times per second. Each display size for the echoMAP combos is offered with either U.S. BlueChart g2 charts, U.S. LakeV HD maps, Canada LakeV HD maps or a worldwide basemap. New Garmin Quickdraw Contours software feature lets you create your own maps, with up to 1-foot contour lines, on any body of water (software available in all models). Low cost meets surprising performance in echo 150, a dual-beam fishfinder with 4 in grayscale display. The color echo 301c is a Powerful, simple-to-use fish finder featuring a built-in advanced HD-ID sonar with or without a 77/200 kHz transducer (supports 50/200 kHz transducer, sold separately). The bright 3.5-inch color display is readable in sunlight. Its 2,400 W peak-to-peak Power provides clear target separation and structure details down to 1,750 feet maximum . Smooth Scaling graphics provide uninterrupted imagery when switching between depth-range scales, and wide viewing-cone angles (60/120 degrees) optimize performance for use in deep or shallow water. It comes ready-to-go with a quick-release tilt/swivel mount and transom/trolling transducer mount kit. So you can get right to fishing. 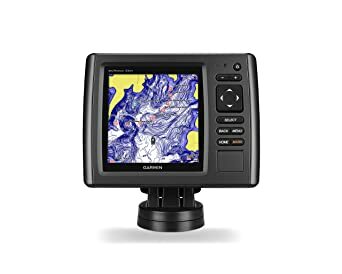 e echo MAP 50dv combination fish finder/chart plotter with 5″ color display has built-in advanced Garmin HD-ID and DownVu scanning sonar. DownVu provides a nearly photographic view of fish and structure under the boat. 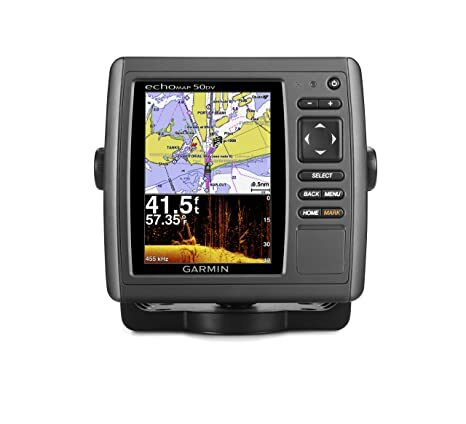 The built-in 10 Hz GPS/GLONASS receiver updates your position and heading 10 times per second to display more fluid vessel movement, which makes it much easier to accurately mark and navigate to 5,000 waypoints. 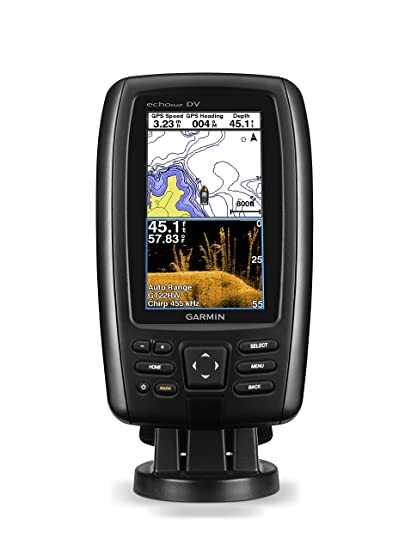 The echo MAP 50dv also includes sonar-recording capability that coordinates the timing of the sonar return with your boat”s position and saves digital information for playback on a computer using Homeport planning software. For even more functionality, wirelessly connect to Apple (mobile digital device) for Blue Chart Mobile. The Powerful, simple-to-use echo 151 delivers the technology you need to catch more fish. 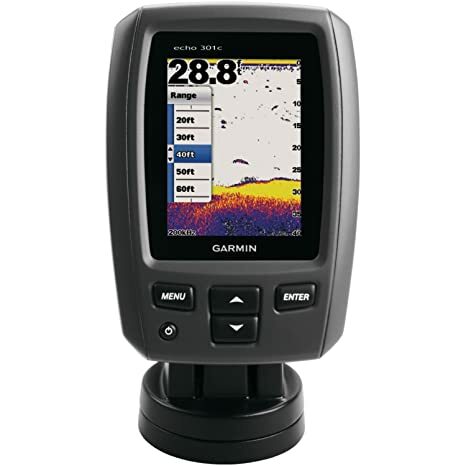 The built-in Garmin advanced HD-ID Dual-beam sonar with a 77/200 kHz transducer (supports a 50/200 kHz transducer, sold separately) gives you excellent target separation and bottom tracking on the crisp 4-inch, 256×160 pixel gray-scale display. Its 1,600 W peak-to-peak Power reaches down to 1,600 feet maximum , and the wide viewing cone angles (60/120 degrees) give you a big picture well beyond the sides of your boat – even in shallow water. It comes ready-to-go with a quick-release tilt/swivel mount and transom/trolling transducer mount kit. So you can get right to fishing.